For the first 64 years of its existence, the Catskill Mountain House was accessible only by a long stage coach from Catskill Landing on the Hudson. 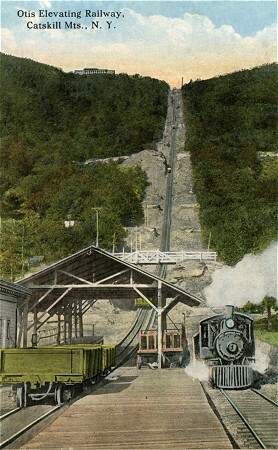 Faced with increased competition from the Kaaterskill Hotel, served by the Kaaterskill Railway, in 1892 Charles Beach hired the Otis Elevator Company to build a cable funicular railroad straight up the Wall Of The Manitou. The line was 7,000' long with a rise of 1,630', a maximum grade of 34%, and an average grade of 12%. Click here for an explanation how the railway worked.In 1904 the line was shortened and the lower trestle was eliminated. The Otis Junction station (pictured left after the 1904 reconstruction) connected the Otis to the Catskill Mountain Railway, a 15 mile railroad between Catskill Landing and Palenville. At the Otis Summit station at the top, it connected to the Catskill & Tannersville Railroad, that ran the 5.2 miles to Tannersville. In 1918, all three railroads were closed and sold for scrap.